Today I want to share why I promote the company I do. And why I feel we have the more potent & proven to work resveratrol anti aging product available today. 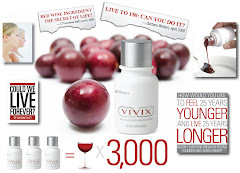 Shaklee the manufacturer of Vivix the brand of resveratrol we market have been in the business of research, development and manufacturing natural health products for over 50 yrs now. They are the #1 supplier of natural nutrition products in the USA. Shaklee products are written about every day and published in google. ~ In Aug 09 Shaklee added a top level to the complan. The company had so many top level distributors they established another level to seperate the best of the best. Here is a short video explaining the "Roots of Shaklee"
Bottomline it's the "Shaklee Difference"
We know that whatever amount of resveratrol and polyphenol blend is listed on the Shaklee label is actually there. You never know with any other brand whether what listed on the label is in the product at all or in the product at the level listed on the label. No government agency is checking to verify this; you have to trust the company. Shaklee has earned that trust; other companies have not. We know there are no pesticides in our product. We don't know that about the competitors. We know that Shaklee ensures that our products do not contain salmonella or lead or anything else that can harm us (and over the 50 year history of our company they never have). We know that our products are tested for bioavailability. Most other companies do not test for this. We KNOW that Shaklee products deliver results without the dangers commonly associated with supplements. We KNOW we can trust our health to Shaklee.Relating the Shaklee Difference is our job and is why we get paid well for it.If the labels could sell the product, we would not be needed and Shaklee could be sold in stores next to the low-quality garbage.